I have people literally cutting contact with me and women telling me I “voted to take all their rights away” and I don’t understand why it’s so much better to support a candidate who was proud to cause a child molester to become acquitted on a technicality, who supported drone strikes killing hundreds of innocent civilians, who perpetuated policies that systematically lead to the impoverishment of millions of people supporters claim she protects as well as hundreds of thousands of children who died via starvation (Iraq sanctions under the second term of her husband’s “two for the price of one” presidency), who attacked victims of her husband’s sexual assaults, and whose enemies mysteriously end up committing suicide. Nevertheless I do not unfriend nor ostracize Clinton supporters. I did not trouble myself to make statements in favor of Trump during his campaign because I do not care to be subject to flame wars and ad hominem attacks from the massive populist support the democratic party enjoys among my peers (young people and the highly educated), but it is baffling that adherents to a movement using such inclusive phrases as “stronger together” and “love trumps hate” could be so vitriolic after suffering a narrow, technical defeat. Supporters of Trump are not necessarily supports of G. W. Bush or recent Republican nominees; the Republican party is simply the only feasible vector for anti-establishment candidates (e.g., Ron Paul). Therefore, one can support Trump yet repudiate the warmongering and elitism of past Republicans, but the converse, while quite feasible for Sanders supporters, is untenable for Clinton supporters. Below are comments I (Richard Thripp) wrote to commentators on Facebook on 2016-11-10. I am not including the commentators’ original comments because I do not have permission and also because what is being addressed is usually self-evident. This is a well-reasoned essay about Snopes that argues it does not have the authority supporters claim nor is its value based on expertise, but that its search for objectivity (or its supporters’ search) is noble and fragile. As for the Clinton body count Snopes article it’s full of logical fallacies. For example, appeal to lack of evidence and the either/or fallacy. If the NTSB doesn’t find evidence of tampering or explosives, then that’s not what downed the plane, and we’re left with pilot error and mechanical failure as our choices. This sentence and many others are replete with reasoning errors. “If evidence of something was not found, it didn’t happen” isn’t necessarily true; for example, evidence may have existed but been obliterated in the crash. There are certainly more choices than human error or mechanical failure. Many other portions portray the argument in “us versus them” terms with “them” being “the conspiracy buffs” and their discredited and illogical claims. One recurring argument is it doesn’t make sense that people like Monica Lewinsky were not killed. This is a misleading argument as well. We don’t see any mention of power differentials between Kathleen Willey and Bill Clinton here. We know the Obama administration has already been killing the families of alleged terrorists. In drone strikes, often there is not an opportunity to target only a terrorist, but others in the proximity must be killed to (e.g., as dramatized in “Drone Queen,” the first episode of Season 4 of Homeland). Of course, Trump may have inferred specifically targeting terrorists’ families, but backed off later. There was a comma between my statement on drone strikes and on policies that lead to starvation and impoverishment. There are more recent destabilizing policies and sanctions that led to these outcomes under Secretary Clinton, but I was citing the Iraq sanctions controversy under Secretary Albright, appointed by President Clinton, relating to Albright’s statements on 60 Minutes, and I alluded to his claims in his campaign that his wife would share presidential duties with him. As to the convicted child molester who Public Defender Clinton represented, there is of course more to the story (e.g., Snopes, Slate). PD Clinton wanted to be removed from the case; she used victim-blaming tactics because they are effective on juries and because expert witnesses recommended it; the prosecution’s mishandling of evidence was their fault; etc. She was “just doing her job” much like defendants in the Nuremberg trials. In Kohlberg’s stages model of moral development, this argument is at the conventional level, in my opinion. Of course this was 40 years ago and we all make choices we don’t like, but there is always another option to doing one’s “duty” when it happens to be unethical. I addressed the Clinton “body count” and Snopes article in separate comments. Yes, I would contend the doubts about people in the Clintons’ orbit who have reportedly died of suicide are still not “case closed,” particularly due to power differentials. 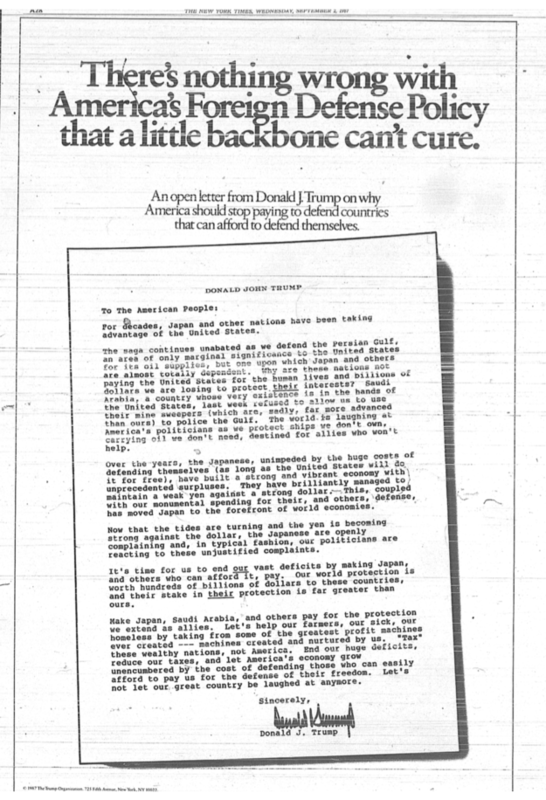 Many of Trump’s views on foreign policy have a history; e.g., his 1987 editorial. Trump “University” shouldn’t have been calling itself a university, but misleading business practices happen among progressive corporations too. For extra credit for a psychology class, I subscribed to the New York Times as an undergraduate. When unsubscribing, representatives of the New York Times blatantly lied to me on multiple separate phone calls saying the billing would stop, and it continued, in one case, even after the newspapers stopped coming. I ended up having to ask my credit card issuer to block any future charges from the New York Times. I disagree. The supporters of Trump who are against the protected groups you mentioned are not representative. Sure, they may feel empowered now, but they have always had their cliques, online echo chambers, and regions of the country where they cluster. About 60 million people voted for Clinton and about the same (233,404 fewer according to the New York Times as of this writing) voted for Trump, who won a technical victory due to electoral districting. Lumping 59.7 million voters together doesn’t help further the ideals of liberalism. Remember, Secretary Clinton and the Democratic party platform didn’t evolve to support various LGBT rights until recently. It’s not like they were supporting gay marriage 15 years ago. Even Obama was only in favor of civil unions, not marriage, during his initial campaign. Of course these are all political statements designed to be broadly appealing to a population with a significant minority in opposition to these rights, but nevertheless, progress is still being made. I don’t think we’ll become refugees, and I think we will bring more heavy industry and prosperity back to our country under Trump. Moving factories to other countries doesn’t stop climate change—CO2 is now above 400 ppm even in Antarctica. It goes everywhere. Factories built in America will probably be less polluting than those built elsewhere. Thanks; I agree with a lot of what you said, [name removed]. People can say all they want about voting one way or another in a manner that takes others rights away, but gee, isn’t attacking someone for making a choice trying to take their rights away? America has a long history of attacking people for making choices. For example, colonists would tar and feather tax collectors for their choice of collecting taxes for the British Empire. But I agree that attacking people for their choice succeeds in suppressing their voices, though some blame should be placed on those who allow their voices to be suppressed by attackers, in some cases. For example, I often do not stand up for my opinions (nor even cite contrary facts) in many cases because I don’t care to be attacked, or in some cases, because I don’t have the energy or don’t feel like engaging in a vigorous debate at the time. Further, many people haven’t yet developed strong debate, reasoning, or logical skills. Debating with them is often the same as squandering one’s time. With a growth mindset, one recognizes these skills can be developed over time—people are not of “inferior” innate potential just for lacking certain skills at this point in their lives. I agree that being kind is important and is often the better choice. I agree also that pigeon-holing people into the categories of “bigots” or “progressives” is neither helpful nor accurate. In addition, however, I would say our time as humans is extremely limited (in the manner of Steve Jobs’ famous commencement speech); it’s a shame to waste time on people who despise us based on political issues, and people who would cut contact with me (about 10 so far) were all just acquaintances I had no serious friendship with. Had they gotten to know me better, they probably would have found other reasons to dislike me. It is outmoded in 2016 to criticize someone for linking to Wikipedia. The Wikipedia articles I linked to themselves link to ample sources in their References sections. I used sources like Snopes and Salon that are mainstream and typically considered biased by the alt-right to lend legitimacy to my arguments. Some of Trump’s statements are indefensible, but so are actions and statements of HRC and spouse. Ending a discussion with variants of “not worth arguing with you anymore” is a sophomoric psychological device and that doesn’t work well on me, and really shouldn’t be used by highly educated people. However, I respect your viewpoints and I also feel we have reached the point of diminishing returns here.